They can talk all they want in this state about Archie and Eli and John Vaught and StarkVegas and Egg Bowls past. This is, arguably, the most significant week in this state’s glorious football history. “I think it’s probably the biggest,” said Rick Cleveland, 49 years a sportswriter in the state, now executive director of the Mississippi Sports Hall of Fame. They say Eli Manning’s last home game here against LSU in 2003 was a big deal. The Rebels and Bulldogs haven’t been ranked at the same time in 15 years. They haven’t been ranked together this high since 1958. The legendary Vaught had a fine run at Ole Miss from 1947-70. The schools battled for the SEC title in 1941. As a Tide fan, I can definitely lose perspective about these sort of games since Alabama regularly plays in high-profile, high-stakes-type match-ups. Bama has won championships and competed for national titles in every decade of my life. For a guy that’s on the back side of 40, that’s saying something. And from that perspective, it’s hard to really fathom what Mississippi fans must be feeling. We may have gone through rough patches, but there was usually some sort of bright, shining light somewhere in the middle of the rough patch, even if it lasted only briefly. For Ole Miss, that hasn’t been the case since since the early 1960s. Yeah, well, except for the brief periods Mannings have been on campus and even then no championships were won. As far as the game goes, I am a bit concerned. Ole Miss has a good team and they are plenty capable of pulling off an upset. When Alabama loses, the common denominator is often a quarterback that plays out of his mind for four complete quarters. It’s not totally out of the realm of possibility that this could happen to Bo Wallace. The Rebel Black Bear defense is also sort of salty and I am a bit concerned about Blake Sims’ shoulder. If he’s off, even just a tad, that could spell trouble for us. Ole Miss will play with a ton of emotion to start the game, but we’ve seen that before. 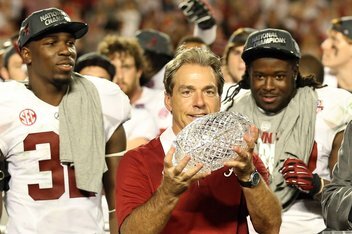 Ultimately, for Alabama, it won’t be about the other team. The game will come down to how Alabama plays. 1) Tennessee 24, Florida 14 – The free continues for the Gators. 2) Georgia 37, Vandy 14 – Todd Gurley rushes for as many as Mark Richt will let him have in this one. 3) South Carolina 28, Kentucky 10 – Let’s see how the Gamecocks rebound from last week’s stunning loss. 4) Alabama 32, Ole Miss 21 – If Blake Sims is really healthy, the Tide rolls. 5) Auburn 31, LSU 20 – Auburn’s offense starts to get their mojo back in this one. 6) Texas A&M 33, Mississippi State 24 – Too much offense from the Aggies in this one. Well, they are finally here – a day late mind you, but finally here. Tuesday numbers. Today we’ll look at one category. 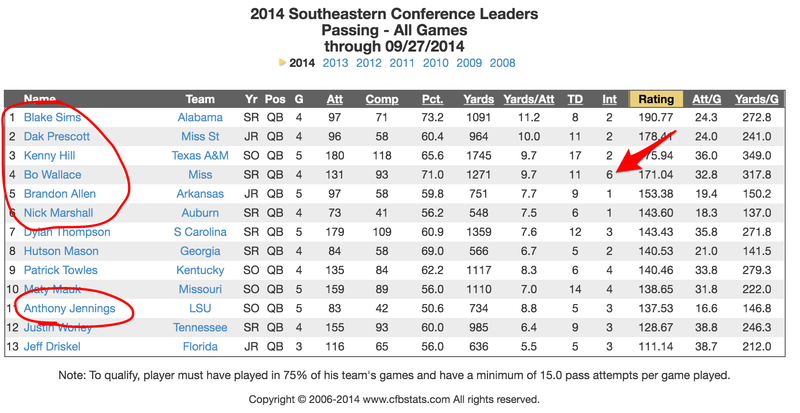 Passing leaders in the Southeastern Conference, sorted by Quarterback Rating. Please refer to the chart below and see the comments that follow. 1) Note that the first six top-rated quarterbacks are from the SEC West. Let that sink in for a moment. 2) Again, the conference’s top six quarterbacks, based on QB rating are in the West. In my humble internet opinion, that explains a lot. 3) The other QB from the West, LSU’s Anthony Jennings, is ranked 11th. And guess what? He won’t be starting this week against Auburn. True freshman Brandon Harris gets the nod for the Bayou Bengals. 4) It may not be surprising to most, especially after the Florida game, but the Tide’s Blake Sims is still the top ranked passer in the league. 5) Of the top six, I’d be somewhat concerned about teams with QBs completing less than 60% of their throws. That mark typically, at least in my internet mind, begins to separate the top level teams from the rest. 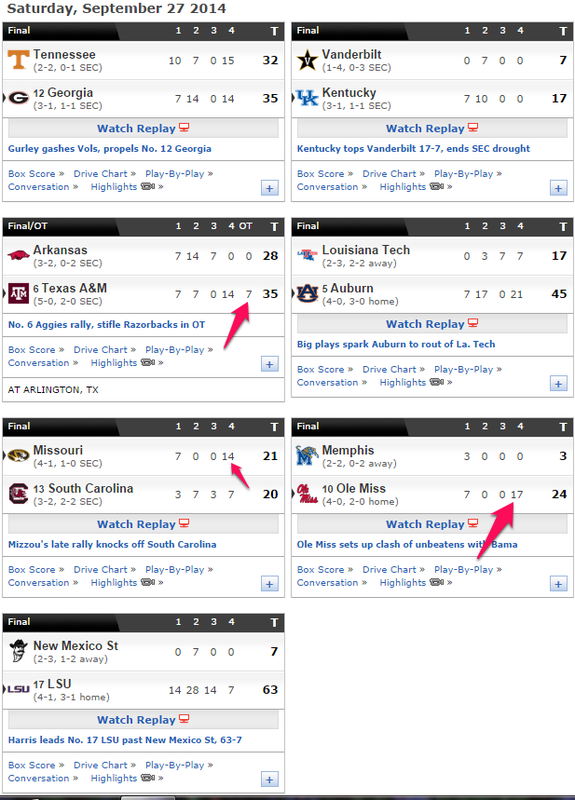 So, look out, Auburn, Arkansas and Mississippi State. Your quarterback’s arm could spell the difference for your team. 6) The final thing to note, are the interceptions of Ole Miss quarterback Bo Wallace. His numbers do not look horrible, at all, and he’s obviously rated as one of the top passers after playing four games. But his interceptions do stand out like a sore thumb and show that he’s playing in a similar way to his last two years for the Rebel Black Bears. For Wallace to truly be elite – and to beat teams like Alabama, he’s got to stop the intermittent barrage of turnovers. Work is killing me right now…so we’ll hopefully have the Tuesday numbers out in a bit. Have a good day and Roll Tide! The Ole Miss Rebel Black Bears are feeling pretty good right now heading into this week’s game against Alabama. I guess they should. After all, they are unbeaten through four games and are ranked No. 11 in the latest Associated Press poll. They also have a pretty good defense. So far, at least statistically, Wallace hasn’t had a bad year. In fact, before last week’s game against Ole Miss (and through the bye week that proceeded it), folks were downright gushy about the RBB signal caller. As the line went, Wallace had been on first since the second half of the Boise State game. But I think the story goes deeper than just these numbers. Let’s face it, if you look inside the big red sort of circle, you’ll see that Ole Miss’ competition this year ain’t all that grand. You’ll also see that Wallace likes to turn the ball over, and those tend to come in bunches. That’s something about Wallace’s play that isn’t new for 2014. Of course, I also buy the line of thinking that Ole Miss, and Wallace, were probably looking ahead to Bama. It’s hard to keep your focus on a team like Memphis when the big boys are rolling into your town the next week. Most of us Bama fans look at the Black Bears and Wallace and aren’t all that concerned. After all, this is a team that hasn’t beaten us since 2003. But I look at this game as trouble. The RBBs have a salty defense, they are playing at home, they have some momentum that comes from being 4-0, and, they do have a quarterback that is capable of getting hot and pulling a Stephen Garcia. 1) Georgia 35, Tennessee 32 [Prediction: Georgia 27, Tennessee 24] – UT allowed a career game from Todd Gurley and shot itself in the foot late. 2) Kentucky 17, Vanderbilt 7 [Kentucky 31, Vanderbilt 28] – This must have been a fun game to watch. 3) Missouri 21, South Carolina 20 [South Carolina 35, Missouri 31] – The Gamecocks are dead in the East and we have a new favorite atop the leader board. 4) Texas A&M 35, Arkansas 28 [Texas A&M 42, Arkansas 24] – The Aggies score two touchdowns late to set up overtime and then pull out the win. 5) Auburn 45, Louisiana Tech 17 [Auburn 45, Louisiana Tech 24] – This game also sound brutal to watch, right? 6) LSU 63, New Mexico State 7 [LSU 48, New Mexico State 6] – What better way to rebound from a loss to Mississippi State than to play an out of conference patsy. 7) Ole Miss 24, Memphis 3 [Ole Miss 37, Memphis 17] – Perhaps the Rebel Black Bears were looking ahead to Bama. Data obtained by the Statesman indicates that a total of 188 drug tests have been administered in the first eight months of Strong’s tenure. From 2010 to 2013, Texas administered an average of 104 drug tests per year under former coach Mack Brown. Many schools just do the bare minimum related to drug testing, so testing all the players after spring break? All you can say to that is…wow. Strong clearly means business about cleaning up the Longhorn culture and you definitely have to applaud his actions.